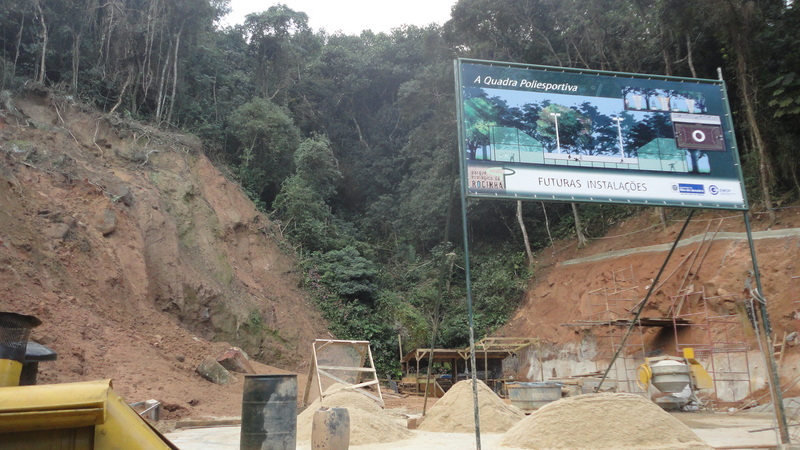 When I first visited the construction site of the Parque Ecológico da Rocinha I was asked to not share photos since the government entities involved in its planning and construction were interested in keeping tabs on how it was presented to the public. At the time, it appeared to be working and references to and images of the Parque were scarce in the cyber realm. One of the telltale signs of informal development is a lack of public investment and another a lack of leisure oriented public space. Rocinha like any favela fits those criteria. And something related, but perhaps less recognized is a lack of texture other than gritty urbanity. Of course this has its appeal, but as textured and wild as favelas are, they tend to lack jungle of the non-concrete type. And it seems that as dense as each kind of jungle is, there tends to be not a lot of room for much crossover. And for residents this means not a lot of opportunity to enjoy the tropical kind. 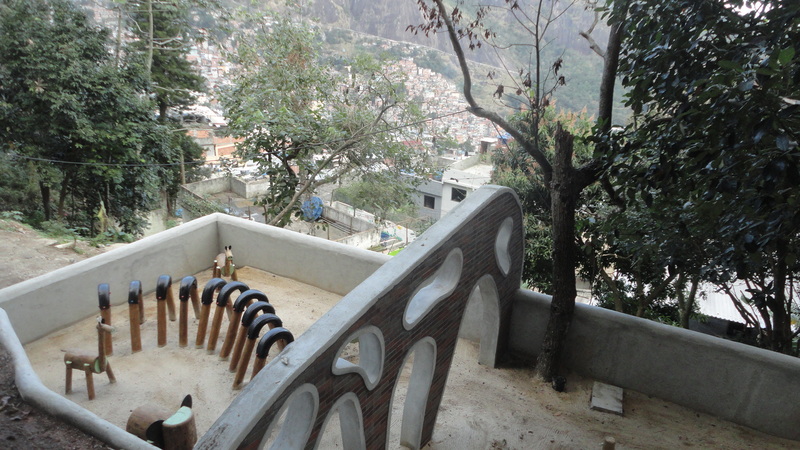 A view from the Parque Ecológico da Rocinha onto Dois Irmãos Moutain’s northwest flank. The view of the Parque Ecolóligico from the Roupa Suja subneighborhood. 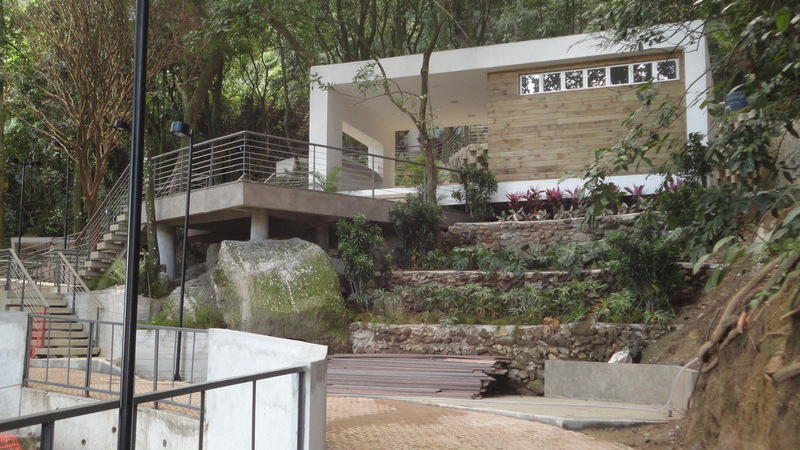 The Parque sits in the triangular strip of forest between Portão Vermelho and Laboriaux. For a guy like me who grew up stomping around the temperate rainforest that adjoined my childhood home, it became an extraordinary experience to visit urban environments wherein access to greenery and wildness was a rarity. 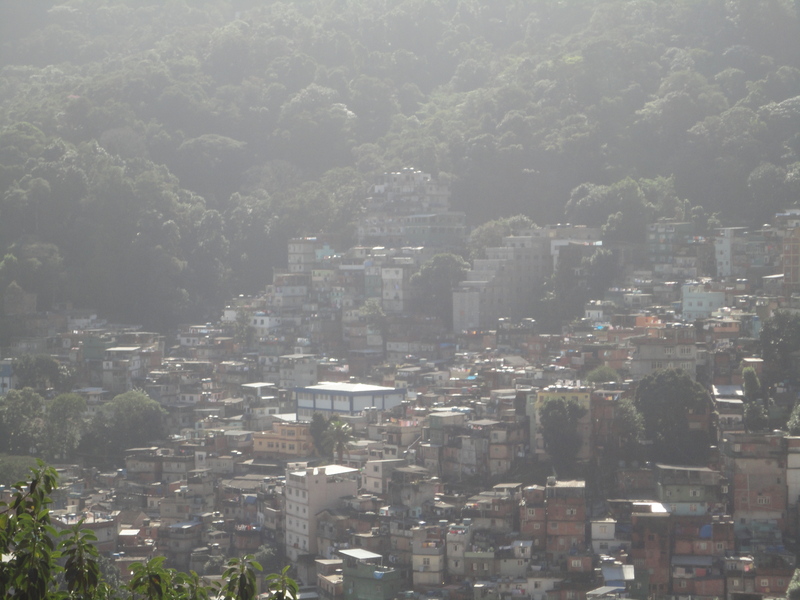 Rocinha is one such place. It’s easy to imagine, in the work-a-day life of the urban poor, that experiencing “nature” is not super high on the priorities list. 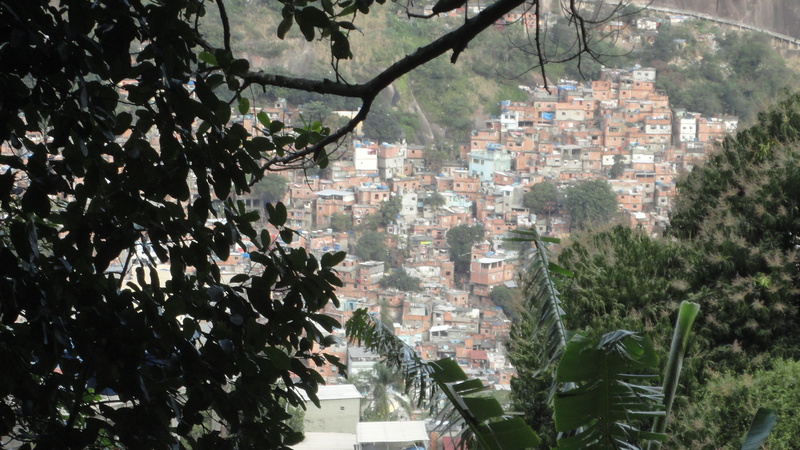 And the urban morphology of favelas in general and Rocinha specifically tells of survival, access to urban employment, access to public transit. But what is does not tell is tempering the urban experience with access to green or wild, natural space. Which seems extra tragic to me since the forest is so extremely beautiful. 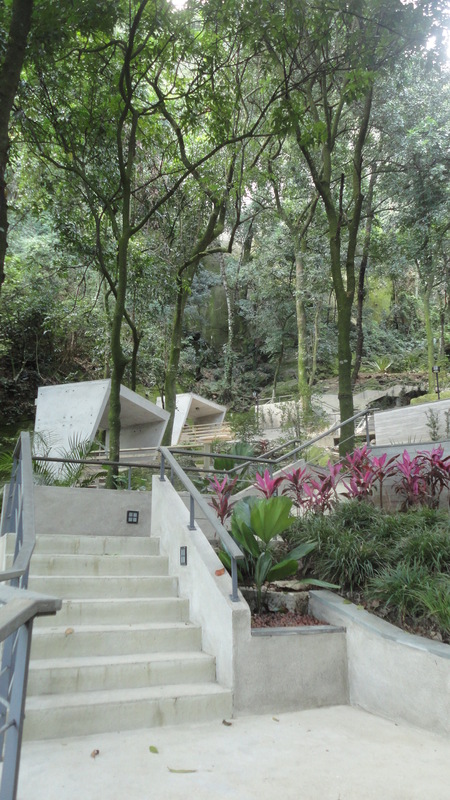 This new Parque serves as a bridge between the two jungles. View to part of the Parque Ecolólogico’s children’s playground. 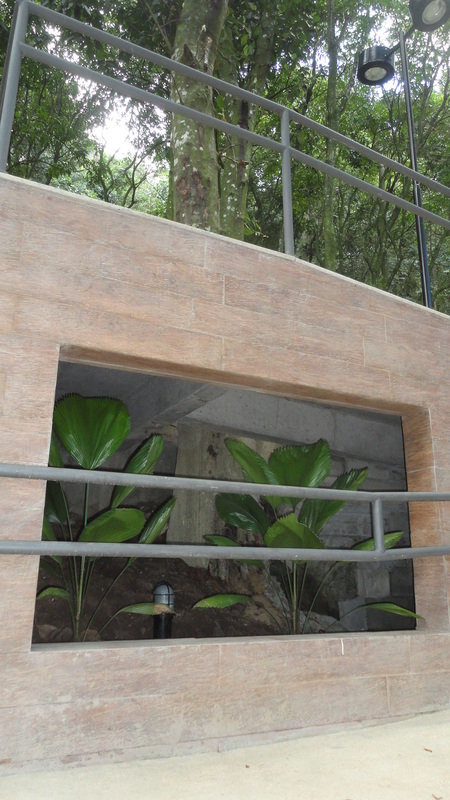 One of the first aspects of the Parque Ecológico that I noticed was the smell of the air. It is laden with that wonderful forest smell of plants becoming soil then becoming new plantlife–in contrast to the smells of Rocinha of all of the inputs and exhausts of urban living. In a city it’s sometimes difficult to recognize that decomposition is part of and the basis for life. That outputs become inputs. Our consumption stream is nearly striclty linear (produce-use-waste-dispose), so it’s often a barrier to an awareness of natural cycles: that in nature waste is food, for example. The very air and soil in the Parque Ecológico are testaments to this phenomenon. 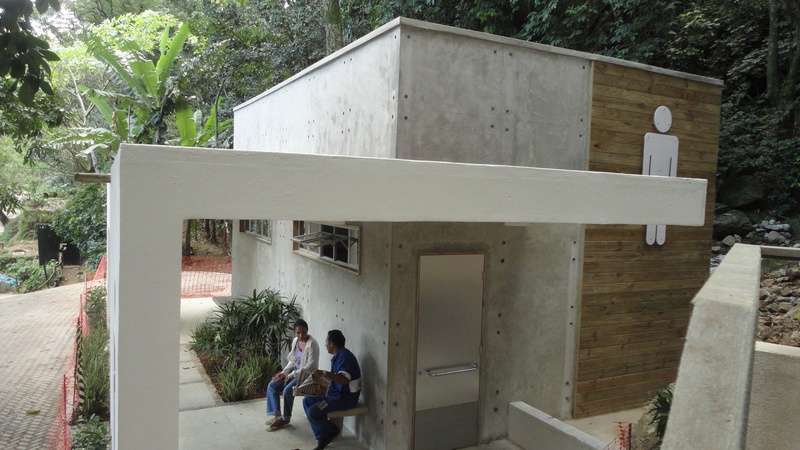 However, on top of this, the Parque hosts not just leisure space but an ecological information center and a library, so residents can experience the ideas of nature as well as the physical experience. 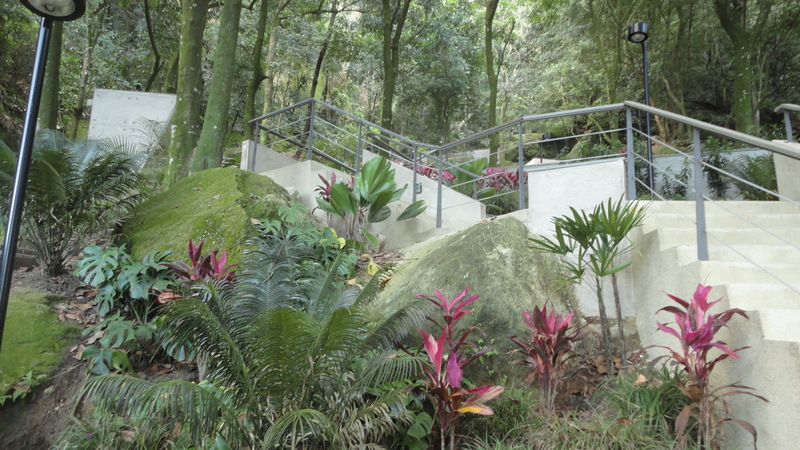 The Parque Ecológico is full of moments such as these that frame and glorify natural elements, for example spotlights at the base of trees, and retaining walls that house creeping plants. The excavation phase of the Quadra Poliesportiva. Can you imagine playing volleyball or soccer with a backdrop like that? How could anyone resist? While I was getting to know the area, I overheard a conversation among some construction managers about how similar public investments in other favelas had been met with misuse and even overt vandalism and theft. Of course this is a stereotypical reaction to a stereotypical phenomenon, distrust that the users will appreciate it and maintain it. This of course leads to a discussion about continued public investment and maintenance. After all it isn’t as if the beaches and plazas in Leblon and Copacabana are left to the residents and tourists to maintain and care for. They have thorough cleanup every night of the week. A tractor combs garbage out of the beach sand, for goodness’ sake. But what I was most struck with was that this new park could not only be a very flattering offering to Rocinha’s residents, perhaps long overdue. I mean, if this were built in my own neighborhood I would be unable to avoid the sense of mutual care and respect between myself and the public enterprises at work. But apart from this–and I personally hope this phenomenon plays out–the Parque Ecológico da Rocinha could be a destination for people from all over Rio and for tourists from around the world who flock to the Zona Sul. To get to the Parque one needs to completely enter and experience Rocinha, something so many people are irrationally, in my opinion, afraid to do. Hopefully Rocinha residents get generations of use from this place, and apart from that hopefully people from outside Rocinha find it a reason to discover what they’ve been missing. Perhaps then we can dispel some of the mistrust and stereotyping that so strongly surrounds favelas. The nearly seamless mix of new plantings an native forest. I was struck and pleased with the level of craft offered even to the restroom buildings. A mark of careful, mindful design and construction in my view. 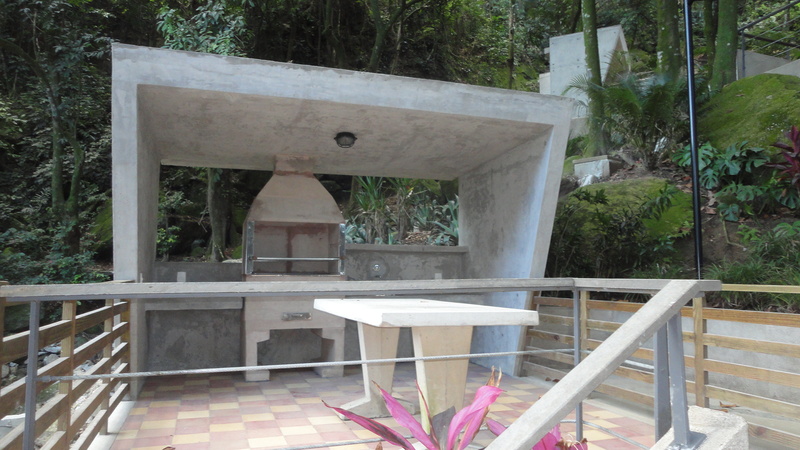 A series of Churrasqueiras follow the path uphill, framing the social uses of the Parque. The winding path of switchbacks offer vertical circulation that struck me as at once meditative and exhuberant. As public intervention into favelas goes it feels much less like triage and much more like a profound compliment. I mean, from the Estrada Lagoa-Barra, the paint job applied to the first layer of Rocinha’s buildings seems, as one guy put it to me: “clowny.” Like at once an apology for and silly attempt at masking the favela’s highwayside façade. But from that level, from São Conrado, a person would never know the gem of the Parque Ecológico existed. It’s first and foremost for the residents of Rocinha to enjoy, without the sense of being pandered to or apologized for. It’s pure public investment in a neighborhood for its own sake. That alone is worth bragging about. And then throw in high design, careful construction, and a killer view of your neighborhood and you’re left feeling pretty good about your day, I bet.